An inquiry has been launched by BAA to look into "what went wrong" at Heathrow Airport as flights were grounded for days following snowfall. The panel of experts from other airports and airlines will judge BAA's "planning, execution and recovery". Thousands of passengers were stranded and hundreds had to sleep in the terminals after the west London airport closed its runways on Saturday. Heathrow is now running 91% of its normal schedule. About 1,196 planes were expected to get through the airport on Thursday, a BAA spokeswoman said. BAA chief executive Colin Matthews said it would spend £10m on more winter equipment. He added: "The inquiry will forensically examine what went wrong at Heathrow, and look fundamentally at our ability to prepare and respond more effectively to periods of bad weather at an airport operating at its maximum capacity. "The inquiry will have complete freedom to examine the sequence of events, and to deliver recommendations for BAA to implement." BAA's non-executive director Prof David Begg, who is also chairman of the British Chambers of Commerce Infrastructure Commission, will head the inquiry. The former heads of Canadian Airlines, Winnipeg Airport, Montreal Airport, Newark Liberty Airports and Zurich Airport will also be on the panel. 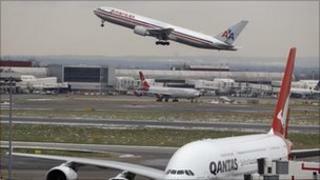 Prof Begg said the panel would talk to airlines and passenger representatives. Heathrow Airport's second runway reopened four days after the first heavy snowfall in London but passengers are still camping at the airport as airlines try to clear the backlog. On Wednesday Mr Matthews said he would forgo his bonus after the airport came under severe criticism with Prime Minister David Cameron saying he was "frustrated" over the delays. A BAA spokeswoman said the airport was "largely back to normal" but there were knock-on effects as airlines tried to gather their crews together. The operations have also been hit by the extreme weather in Europe, she added. Has Heathrow's reputation been damaged?